The school to which I went from the age of 5 to 13 displayed each hapless infant’s performance on huge boards. My shame was visible to all. The ultimate tribute was a gold star. I never got one, until today. 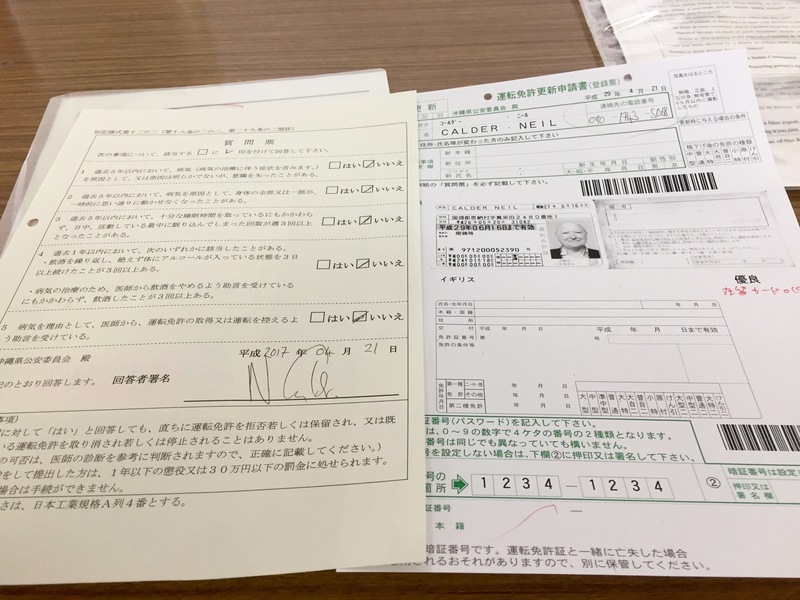 I go to the Chatan kinda DMV place to renew my driving license. It is early in the morning as I have a very busy day and hope to get the driving license stuff expedited before lunchtime. 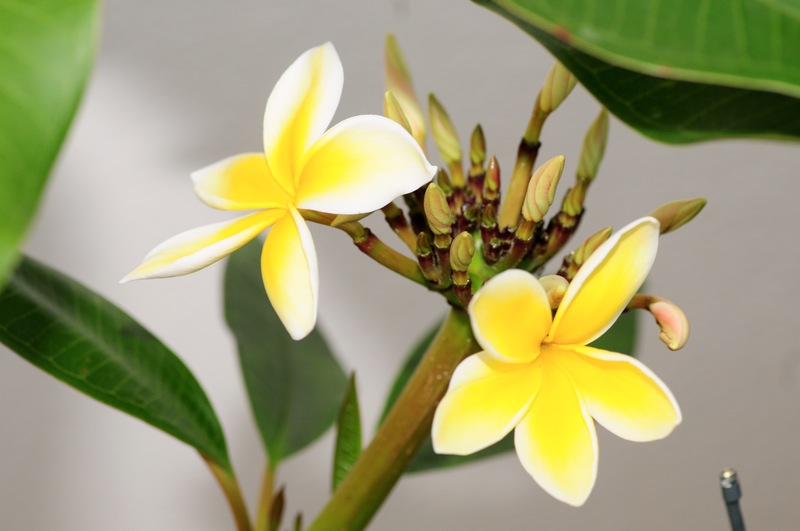 Notwithstanding, before I leave I check the Plumeria and am rewarded. First blooms of what I hope will be a sensational year. 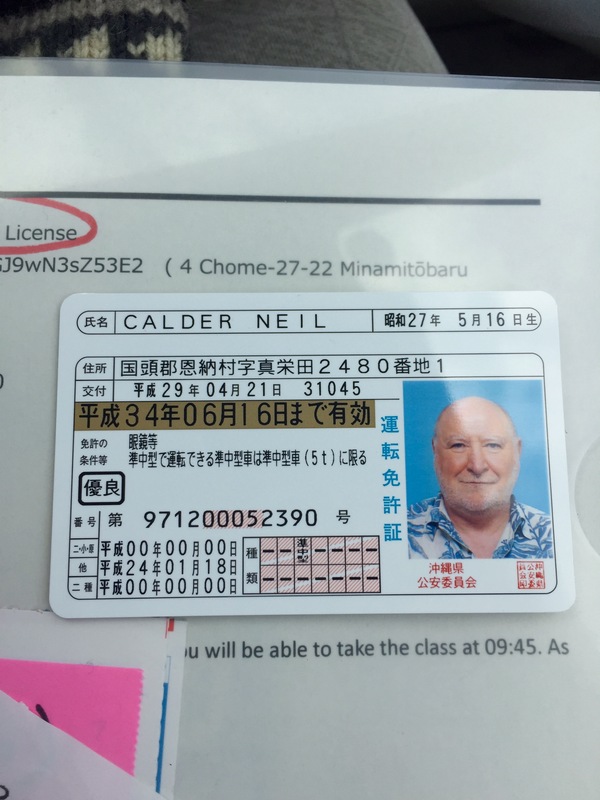 Getting your license renewed is totally Japanese, no-one speaks a word of English. 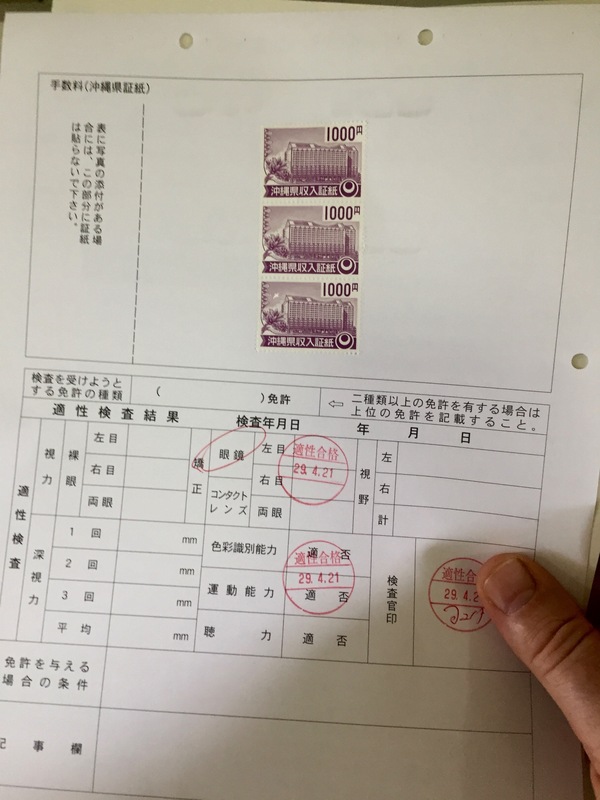 I go to Station 1 and check in with driving license, my status is blue by the way, my residence permit and am rewarded with forms. I go to Station 2 where they check my eyesight. With necessary receipt I proceed to Station 3 to pay. The place is ultra crowded, by the way, with lines for each station. Station 4 and 5 I have really no idea what was happening, but I passed. Station 6 was photo time and the best fun. The staff are very considerate and gentle. I then go to Station 6 and I pass I know not what. After this Odyssey, I get to the place of devotion, a huge room full of fellow travellers, where we watch a movie of a driving instructor laying down the good stuff to a pupil. After a lengthy pause, a sensei arrives and harangues us for 30 minutes about the fragility of human life. His talk is illustrated by loads of movies of car crashes. Next, 2 cops stride in and ask those with numbers between 201450 and 201461 to form a line. Yeehaa! I am number 201459! We form a line; trembling, I am handed my new driving license and it is Gold! Achieving a Gold star in Japan makes up for so many failures in my youth. 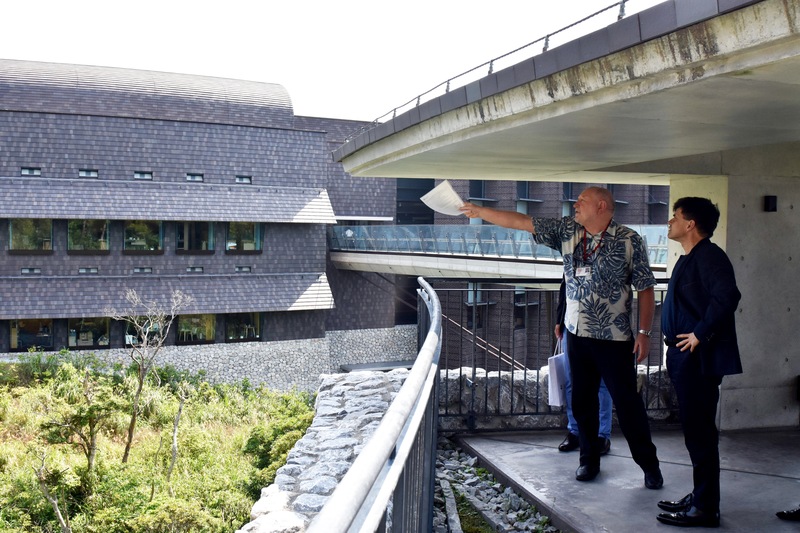 I rush back to OIST to entertain the Slovak Minister of Education, Science and stuff. This is the best fun as he is a very good and funny guy. He also has huge feet. Upon a peak in Darien. Check his feet. 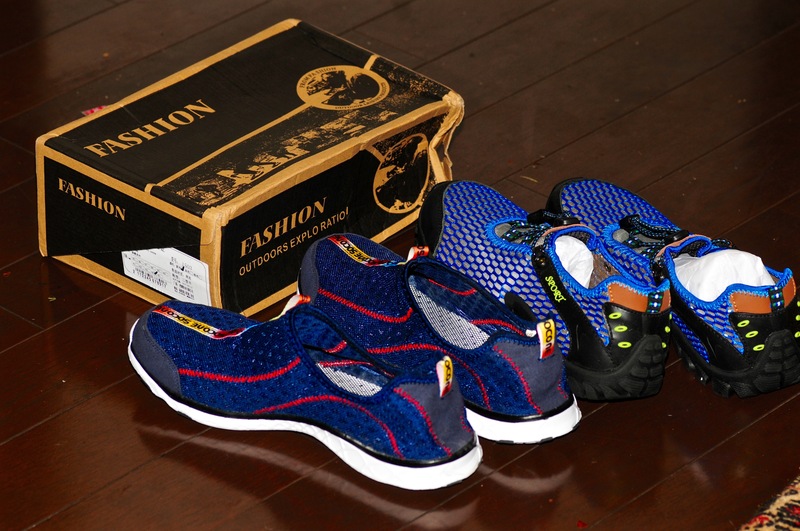 In preparation for the adventures of Summer, I have bought water shoes on EBay from China. They are sent to my house in Maeda. This is what makes living in Japan so pleasant. The card that the postman leaves to demonstrate that delivery did not work has a telephone number for English speakers. ” We apologizes Sir, that your package was delivered at the wrong time. At what time would you like us to take it to you? At 7:00 pm on Friday night, my man hands overs the goods. Life is so easy in Japan.